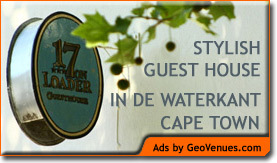 Accommodation in Langebaan: Glenfinnan Guest House. 4 Star graded luxury accommodation offering 5 en suite bedrooms with a choice of twin or queensize beds, own entrance, secure parking and superb breakfasts in a home from home atmosphere for the discerning traveller. We are within easy walking distance of the beach and restaurants, and 5 minutes’ drive from the entrance to West Coast National Park. The lagoon is a watersports paradise, kite and windsurfing, angling etc. and a birdwatchers’ delight. Ecotourism at its very best. Langebaan is ideally situated as a base for day trips to the surrounding areas of the West Coast (great seafood) and Riebeeck Valley (outstanding wines and olives). We even try to speak French and German! Under personal supervision of Kay & Jim Law.